L.A Spas dealers have gained an autumn boost with the launch of a new UK website to highlight their showroom locations and help increase awareness of the brand’s cutting-edge hot tubs and swim spas. The www.laspas.co.uk site is the latest initiative for the L.A Spas network, under the stewardship of Essex-based exclusive UK distributor Aqua Warehouse Group, to increase awareness of the brand now that it has become part of MAAX Spas Industries Corporation owned by Brookfield Asset Management, a global enterprise with over $100billion in assets. It has been designed to enhance footfall at L.A Spas showrooms run by the flourishing network of UK dealers including: Sheffield-based Aquafun, Tewkesbury-based Clear Natural Spa’s, Cornwall-based Cornish Hot Tubs, Northumberland-based Felmoor Leisure Ltd, Solihull-based GVS Swimming Pools, Lincoln-based Gray Fox Swimming Pools, Wanlip-based My Spa, Skipton-based Settle Hot Tubs, Southampton-based Swan Pools & Spa Centre, Aberystwyth-based Welsh Hot Tubs, and Northern Ireland-based The Hot Tub Centre. The launch of the website follows a historic L.A Spas seminar in the summer that was the first for over six years for the L.A. Spas dealership network at the Grade II Listed Mansion Bosworth Hall Hotel & Spa in Market Bosworth, Warwickshire; for dealers, pictured, to gain an insight into what direction the brand would be taking with the support from new UK distributor Aqua Warehouse Group and the manufacturing stewardship of MAAX Spas Industries Corporation. Aqua Warehouse Group chief Richard Hart has pledged that Sean and his distribution team is committed to continuing to work closely with the L.A Spas dealers and move forward together in the future. “It was very noticeable during the seminar that the dealers were impressed with where and how we would like to move forward with the brand,” reported Richard. Along with the L.A Spas hot tub range, which includes the WhatSpa? Best Buy Award-winning six-seater Belmar LX model, which comes in at 211 x 211 x 89cm in the £4,000 to £5,999 category price range; the brand’s In-Fit Exercise Pools, including the WhatSwimSpa? Best Buy Award-winning In-Fit 13 SL, which comes in at 3.96 x 2.34 x 1.35m and has gained back-to-back recognition in the sub-£14,999 price category of the consumer magazine, are also showcased on the website. 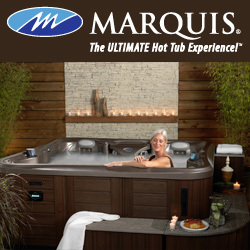 As well as promotion of the innovative L.A Spas hot tub and swim spa technology, including the Aqua Klean filtration system, there are also testimonials from L.A Spas owners, plus dedicated brochures and manuals for prospective customers to gain additional information as part of their research ahead of making a purchase. Along with his Aqua Warehouse Group team members, Richard Hart will be exhibiting at the fourth trade and consumer UK Pool & Spa Expo exhibition at the Birmingham NEC from November 22 to 24, in the Pavilion Hall.